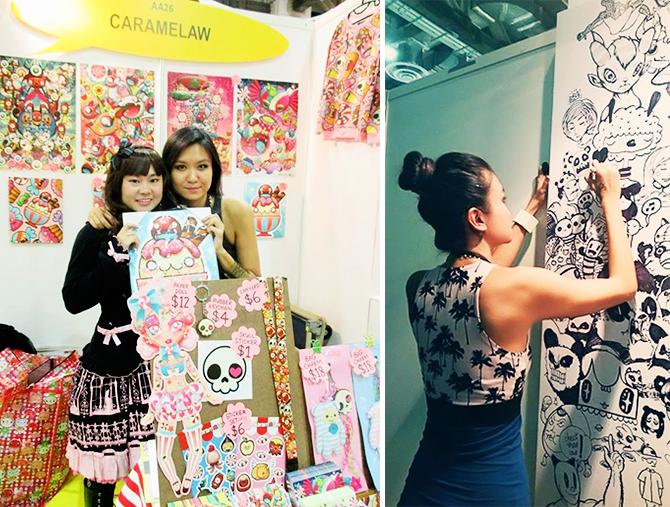 Kels Shark: Indie Interviews | Sheena of Caramelaw! Thank you for joining us today on Kels Shark, Sheena! Can you tell us about yourself and your business? Thank you for having me! I am a video editor/motion graphics artist by day. When I get home in the evening, I work on my candy art and dolls. I'm an adventurer, dreamer, and monster-creator. 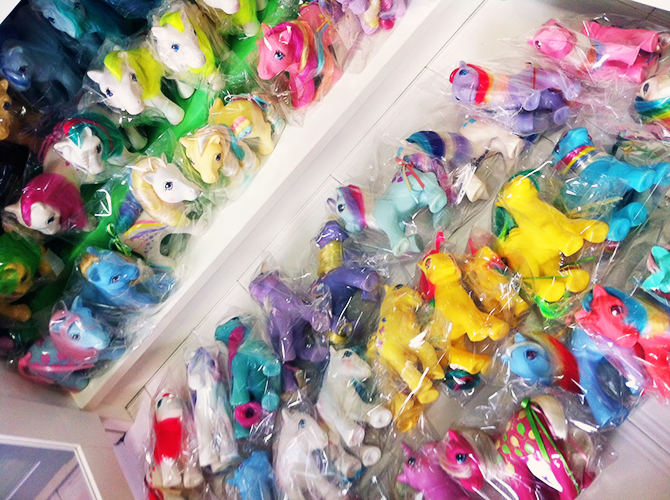 After a hard day’s work in the office, I ride on my unicorn and trundle down the magical rainbow bridge into my studio for a bit of action, making candy art, and customizing vinyl toys and dolls. Occasionally, while stuffing lots of chocolates into my face and drinking tea. Cute + morbid: that sums up my work perfectly. 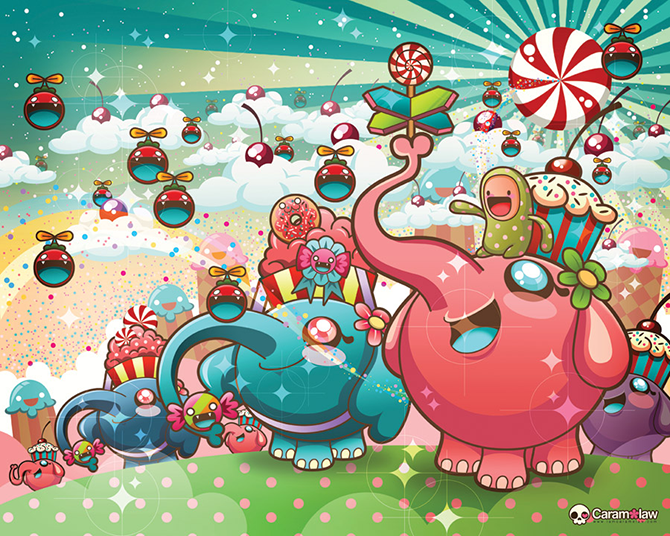 I aim to make people happy by making happy candy art. 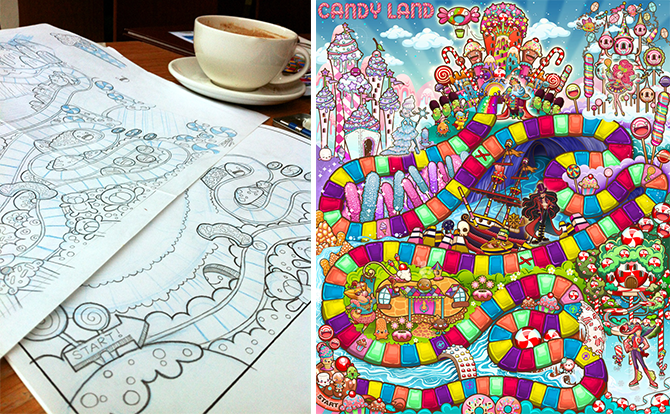 Where do you draw inspiration from for your vibrant, colorful artwork? Toys. Lots and lots of toys. I love surrounding myself with toys. Vintage My Little Ponies, Blythe Dolls, designer vinyl toys... my studio is a toy store, a mini toy museum, a toy sanctuary. I have so many toys that everyone thinks I’m a hoarder. Truth is, they inspire me so much. Their innocence, their colours, the way they work, and the way they look triggers so much imagination and possibility. The possibility of being able to incorporate this cute, tiny, colourful object into my art. The environment where you work in plays a big part when you’re churning out artwork. Sometimes you lay back in your chair, wonder and look around the studio. Things lying around might just give you a brilliant idea. I play with my toys, stack them, arrange them, clean them, knock them over, and arrange everything again. As strange as it may sound, I find it rather therapeutic. It calms me in a way, much like how you take a holiday to relax and get your mind off work. For me, its me and my toys. I also draw lots of inspiration from my surroundings and nature itself. I love going around observing people, animals, things, places, textures... anything that can trigger off ideas. It may seem like I'm just sitting at a corner and zoning out, but in actual fact, I'm just watching things. Many a times we are all so busy with our everyday lives that we forget to stop in our tracks to appreciate everything around us. And when we do, you'll be surprised on what ideas it might bring into you. Can you walk us through your illustration process, from idea to finished product? I start by sketching. LOTS AND LOTS of sketching until I get the look and feel right. Sometimes I use colored pencils to do a little bit of coloring in, just to plan and have an idea of how this artwork, might look with the colors I have in mind. Once I've more or less selected the colors, I’ll scan the image and import into Adobe Flash. I love using Adobe Flash. The basic tracing and base coloring happens here. This allows me to make changes to things like corner, curves, sizing, and proportion effortlessly. Drawing in Adobe Flash is a breeze to me, its really easy to use and it suits my work process. I do all of my illustration in Flash and export the layers out as PNG files. After that, I’ll do the rest of the composting and touch-ups in Photoshop: adding tone, gradients, shadows, transparency, etc. I first found you through your beautiful custom Blythe girls! 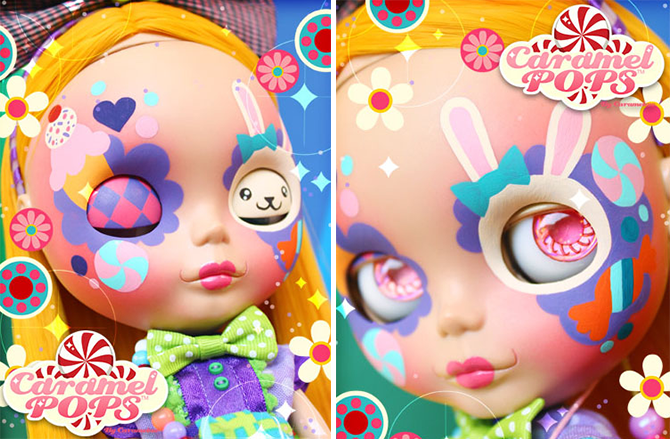 How did you get into customizing dolls? I was stalking the My Little Pony forum (I was a vintage MLP nut and still am) and there was this little section called "dolls". So there it started, from one Pullip to six Pullips in a month. Now I have over 70 Pullips and Blythes sitting in my studio. It is an infectious and addictive hobby and I've never stopped collecting dolls since. I remembered coming across these beautiful and unique custom Pullips called Zombukis, made by Brigitte, and something in me lit up. I was in awe of her dolls and how every doll she created has a story behind. Then I thought to myself: I wanted to customize dolls too! How do you go about starting a new custom doll? 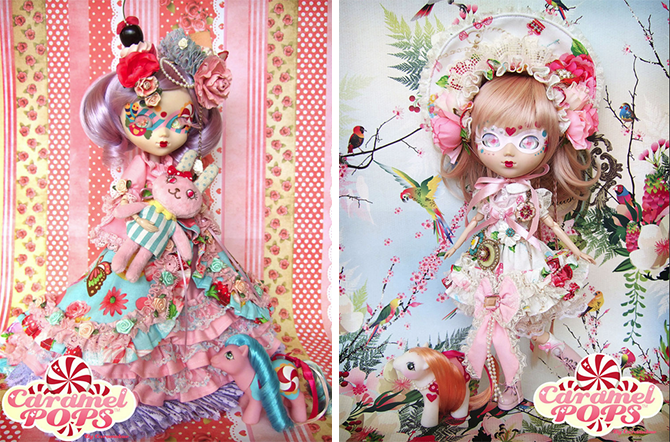 Most of the dolls I made are for doll collectors from all over the world. They give me a general brief on what would they like to see on their doll and then leave the rest to me to decide (colour, candy elements, rainbows, etc.). 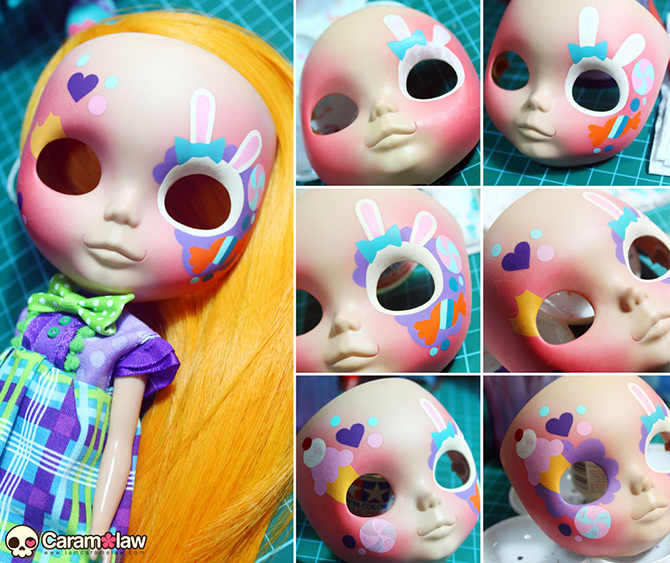 I start off by prepping the doll, which includes matte-ing the face, followed by lip, philtrum, and nose carving. After that, I apply pastel makeup onto the face plate and then start doing a rough sketch on it with a yellow coloured pencil, according to what I feel my customer would like. The face painting is what follows after, but before I do that, I usually pick an outfit first so this gives me a rough idea on what the colour scheme of the doll should be. When it comes to colour, I am REALLY picky and I must make sure the overall colour combination of the doll is right before I start the paint work. This applies to my artwork and illustrations as well. 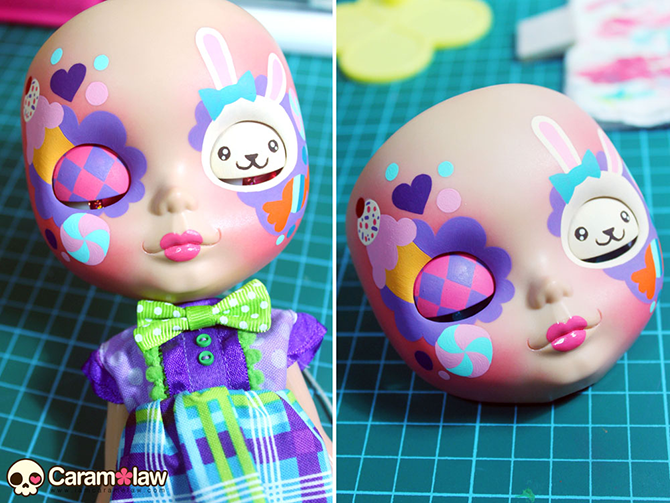 Its quite fun mixing and matching and I love making my custom dolls as colourful and whacky as I can push it. The challenge is to be able to incorporate my customer's requests into the doll design with a touch of the Caramelaw style. 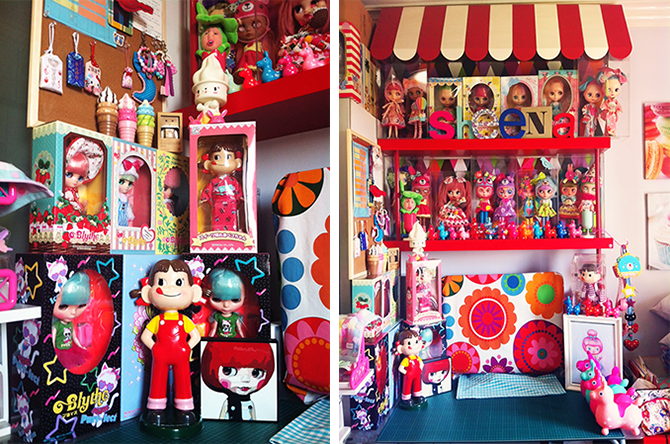 Do you keep any dolls in your own personal collection? Yes, I do, of course! 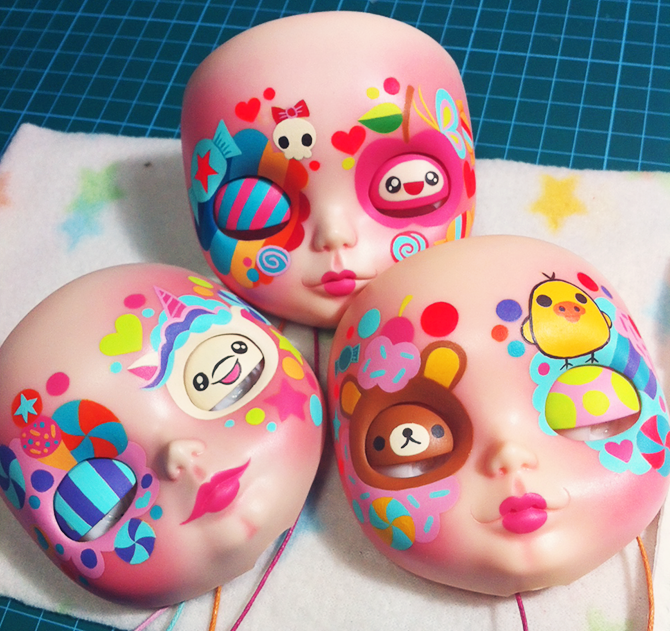 I own 2 yarn heads from Dr Blythenstein (another one on its way), a cherry head from IMREAL, a Zombuki, 2 Boopsies by Missy Munday, and several other custom dolls made by various doll customizers. I have a total of 73 dolls (I think), consisting of mostly Blythe and Pullip dolls. Unfortunately, I don't own any of the dolls that I made - they were all made for other doll collectors. I would really love to make myself a couple to keep in my own collection one day! What was your favorite (or one of your favorites) piece to create? I am a HUGE fan of Adventure Time and I really had fun making the Adventure Time series of Caramelpop dolls. I made Lumpy Space Princess, Treetrunks, BMO and Princess Bubblegum. They are all adopted and now I am planning for some other Adventure Time characters! Are you working on any new projects or pieces that you are excited about? On the customizing end, I'm planning on a few customized dolls and toys, including a giant pink bear brick and an astro girl. I'm not sure when I can actually finish them because there are lots of empty surfaces to paint, but I'm excited! Also planning to produce a vinyl toy series called "Wonderous Floating Circus," but nothing concrete yet. 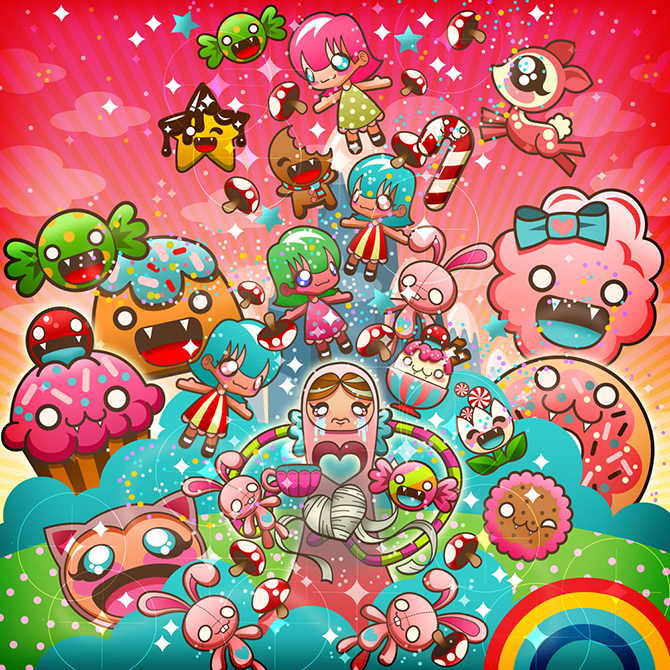 Check out Sheena's beautiful, candy-colored work! All images in this post belong to Sheena of Caramelaw. Visit here for more Indie Interviews! Are you an artist or do you know of an artist you'd like to read an interview with? Check the FAQ page for more information! WOW! 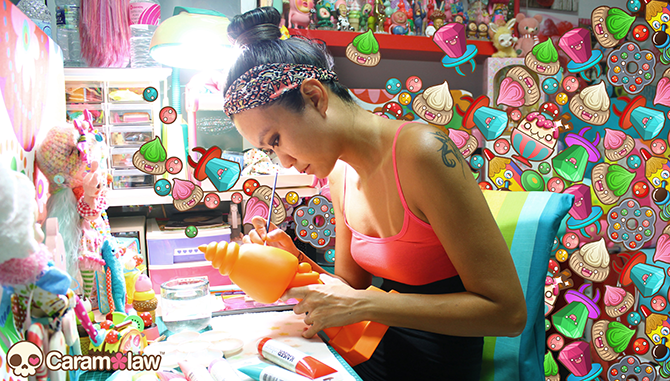 Her work is so bright, colorful and CUTE!! Her illustrations are AMAZING! Glad you are a fan of Sheena's work too! Isn't it awesome! Agreed! I had the HARDEST time picking which illustrations & dolls to feature!